Most stations are built on a typical design. The way a disabled person uses these stations is by a lift from the road level to get to the station level and then another lift from the station level to the train line level. 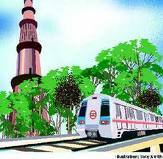 Except the Qutub Minar that has a ramp to the station level station and the HUDA City Centre stations which is at road level. Minar station the ramp leads to the station itself. These ramps are designed to no specifications and therefore are mostly very steep and at places also lack handrails. 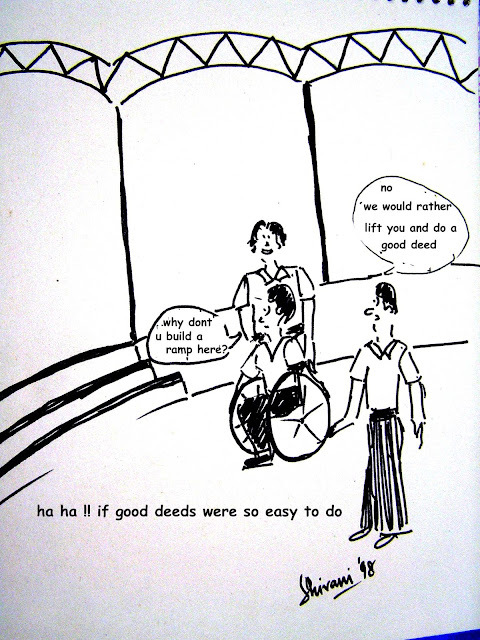 Some of these ramps are far to steep to be used safely example – MG Road station. • The ticket counter is behind a glass screen without a loop induction or a sound amplification system hence making it difficult for hearing impaired persons to communicate. Passes are to be purchased from the customer care office, that to has glass on the counter. Additionally it is difficult for a first time user to know where to go to buy passes as it is not clearly signed. • The security gates are narrow that do not allow a wheelchair to pass. Therefore in all the stations that we entered the wheelchair user along with a helper were not checked by security personal. • There is a wider entrance gate that is to be used by users on wheelchairs, but in spite of having this provision a disabled passenger is required to take assistance from their staff as this is always barricaded. At some stations the wheelchair user passenger is separated out and made to enter from a different gate that has to be unlocked especially for them. • The train has a gap from the platform. The gap varies and is larger at some stations. Additionally there is also a level difference between the platform and the train floor at some stations. This makes boarding and exiting out dangerous for most disabled persons. In fact during our trip the front wheel of my wheelchair also got struck in-between the platform and the train. • There are tactile guiding blocks that are used throughout internally in the station. There were points where this guiding path was blocked hence becoming a barrier for visually impaired persons. It will make an interesting study to know how many blind users actually find the tactile paving beneficial. • While exiting out disabled passenger especially a wheelchair user is made to exit from the entrance gate, again requiring addition ‘special’ assistance. • The toilets and the lift are outside the exit gate therefore if a disabled passenger wants to use the toilet or the lift would need to travel a long distance to reach it, having made to exit from the entrance gate. This is contrary to and accessible design planning where travel distance of disabled people is kept to the minimum. • There are earmarked accessible toilet facility provided at each station apart from the ladies and gents facilities, but unfortunately in the way fittings are put in the accessible toilet, they are not usable by disabled people. Moreover the accessible facility is not maintained and often even kept locked. • The biggest blunder that I see on this line (I haven’t seen any other line) is the parking that is provided for the metro users in five out of ten stations is across the road. The entrance from the parking is only by steps. Therefore for a disabled user (wheelchair user especially) who may need the parking facility to be accessible more than any other user, does not have access to it. Additionally it is discriminatory when two entrances are provided to all users but only one entrance is available to disabled users. • What is the procedure that they adopt to assist disabled passengers incase the lifts is not working. Is there a system where information of lifts that are not working may be available to disabled passengers in advance to save them from making a useless trip. • Do they have a map or ready information available for disabled passengers to know which entrance is accessible considering not all of them are accessible. • Complaining system – what steps have they taken to ensure that it is accessible to visually impaired persons. read more of your useful information. Thanks for the post. I’ll definitely return. Nice article,by keeping welfare related to disable persons great issues and suggestions are listed here,Government should ponder on this issues.I think Jaipur metro will take care of these issues.